NiRunning ‘Killylane Klassic’ 5 mile Trail Race 2016 Results are now available HERE. We would like to take this opportunity to thank everyone who supported the ‘Killylane Klassic’. NiRunning are happy to announce that the 3rd annual running of our Killylane Klassic 5 mile Trail Race in Ballyboley Forest, just outside Larne, will take place on Saturday 2nd April 2016 (11am). 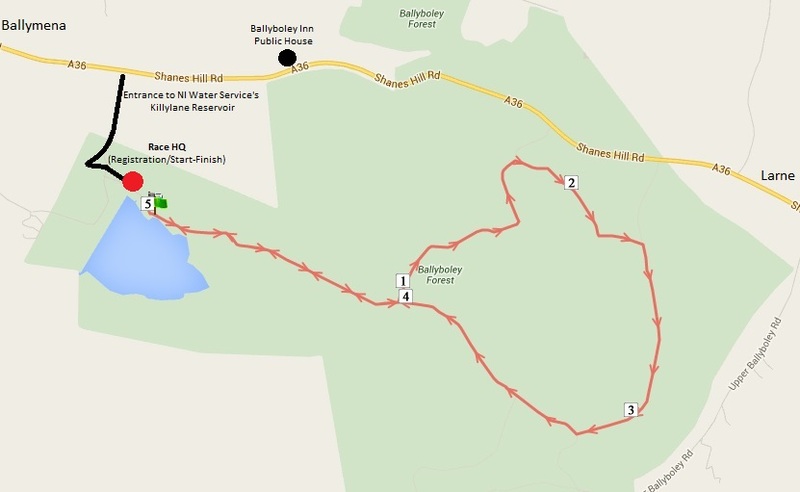 The Race HQ (including Start/Finish and Registration) will be at the Killylane Reservoir side of Ballyboley Forest with access and (very limited) parking available via the Water Service entrance, off the Shanes Hill Road between Larne and Ballymena (close to the ‘Ballyboley Inn’ Public House). A directional map is available HERE. Note: Please car share if possible. Online entry for the event in now AVAILABLE. See above for details. Proceeds from this event fund the free NiRunning website. Location – Ballyboley Forest, Larne (Important – Race HQ is at the Killylane Reservoir side of Ballyboley Forest). Registration/Entries – 9.30am to 10.50am SHARP! Sorry but we will not delay the start of the race to accommodate late entries. Prizes: The top first three male and female athletes will receive prizes. In addition to this, there will also be prizes for the male and female winners of the following categories: Vet35, Vet40, Vet45, Vet50, Vet55 and Vet60. Please note that only one prize will be awarded to each athlete; ie a Vet35 overall winner will NOT receive a category prize on top of the overall/main prize, the category prize will be presented to the next finisher in that category. Please be sure to provide your age category (date of birth) on the entry form if you wish to be considered for category prizes! Cost – Online entry is now available (above) and will be charged at £5 for Affiliated Athletes and £7 for Unaffiliated Athletes. On the day entry will cost £8 for everyone. We would appreciate it if those intending to compete would use this, so that we have a good idea of numbers expected on the day. NiRunning 5 mile Trail Race 2015 results are available HERE. Thank you to everyone who supported the event and especially to the volunteers who made it possible!